Observations and questions about mysteries of the universe, life and consciousness are sources of visual ideas for my paintings and constructions. 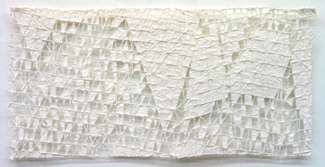 Making these works is an ongoing process of experimentation and negotiation between ideas and materials. Signe Stuart, abstract painter, known for expressive explorations of materials -- canvas, paper, tyvek and vacuuforms -- in making work. She has exhibited in galleries and museums across the United States since the early 1960s. Her works are in several museum collections: New Mexico Museum of Art, Joslyn Art Museum, Tacoma Art Museum, Sheldon Art Museum, North Dakota, South Dakota (Signe Stuart: Retrospective 1995) and Utah Museum of Art and others. Corporate collections include First Federal Reserve Bank and 3M Company of Minneapolis, IBM of Raleigh and others. Stuart has received an NEA Artist Fellowship, an NEA Art in Public Places commission and several artist residencies, including those at Grinnell College and the U-Cross Foundation. Her works have been represented by galleries in Chicago, Minneapolis, Columbus, Omaha and the William Siegal Gallery in Santa Fe. Six women artists providing critical support and sometimes exhibiting together.